Which countries have the lowest graduate unemployment? Making the most of human capital is crucial for countries to build strong and sustainable economic growth, and one way of doing so is to ensure university graduates can find employment to take advantage of their education. Data from the Organisation for Economic Cooperation and Development shows the percentage of people aged 25-64 in OECD countries with a tertiary level of education who were unemployed in 2013 (the latest year for which data is available). 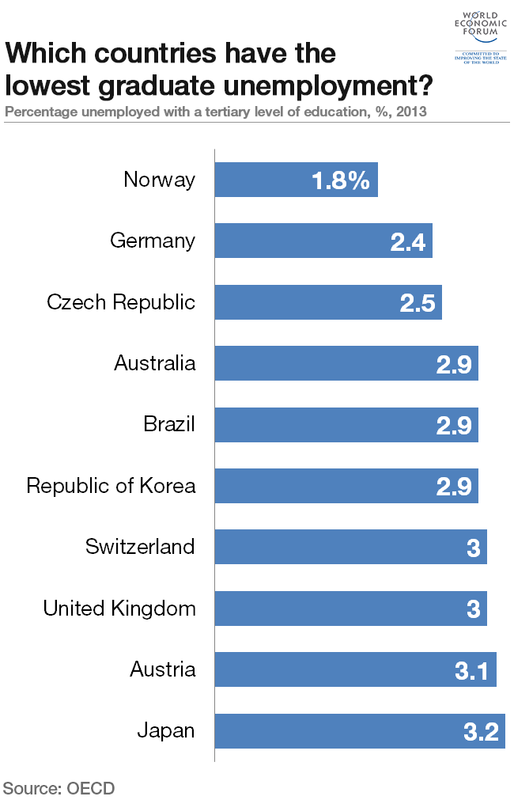 Norway tops the list, with less than 2% of its tertiary-educated labour force unemployed. Germany and the Czech Republic also have low levels of graduate unemployment. By comparison, in 2013, 19.4% of those with a tertiary education were unemployed in Greece. These data are taken from OECD Employment Outlook 2015 report. “Unemployed” is defined as those who are not currently in employment, but are actively seeking employment and are immediately available to start work. Tertiary education is defined by the OECD as the International Standard Classification of Education (ISCED) Levels 5A, 5B and 6. Author: Paul Muggeridge is Head of Content at Formative Content.